I thought I would check-in on some of the fashion week happenings. Although I am not in attendance, my invitation got lost in the mail perhaps, I still like to take note of the trends for next season. It seems as though I was just saying how much I love fall, and I am already forced to think of sandals and flowy dresses, you cruel fashion world! But here it is, my first favorite show of the week, Derek Lam, courtesy of Vogue.com. 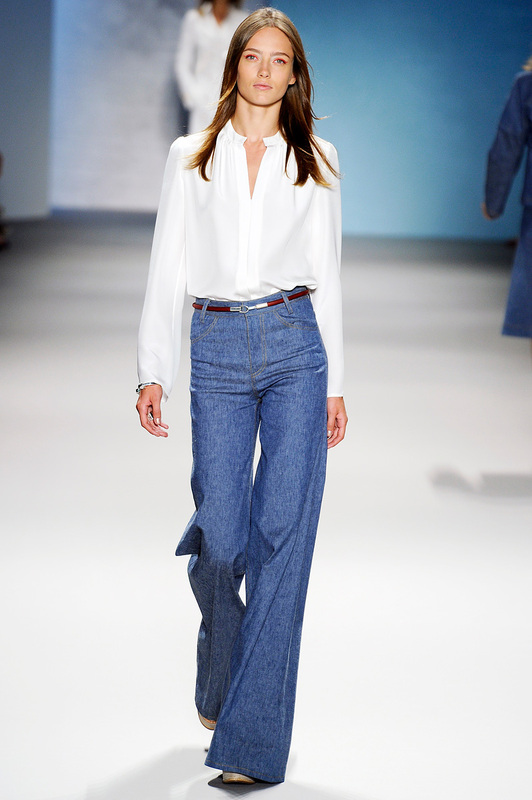 Based on this show, I am happy to see that the 70s pant leg will still be in style next season because I am still on the hunt for the perfect pair, as well as some other 70s styles. The poncho also seems to be sticking around in both traditional and contemporary cuts, which I couldn’t be more thrilled about. (I did find the perfect one of those, which I will be sharing with you soon.) Overall I just love how sophisticated everything looks. Classic houndstouth is given a make over. I love the more contemporary patterns and silhouettes as well, especially the dress with the oil-painting like pattern and the gray-green suit. What show have you been excited about so far? We have the same taste 🙂 I posted this earlier this week as well. I am in love with this collection. So elegant, clean and classy.